We've developed several Tools to REVITALIZE your Furniture. Click here to download the most current PDF brochure about the Expert Factory Re-Conditioning Cardinal Church Furniture offers! (1) Seat – (2) Back – (3) Back of Back. 1. Wood Parts are satisfactory to the customer, leave AS IS. 2. Stain Touch Up and New Top Coat for your Existing Wood Parts. 3. COMPLETE Sand Down to the BARE WOOD and Factory Re-Finishing of your Existing Wood Parts. New Stain, Sealer and Top Coat. No matter which option or combination of options you select, we’ll make your furniture upholstery and/or finish look factory fresh. We recognize that the most powerful members of our Sales Force are Our Satisfied Customers. To insure that our customers are satisfied, we use the finest materials available, combined with quality craftsmanship in our modern factory to appoint furniture which is both beautiful and built to last. We are dedicated to our vocation to Adorn Churches. We’ve spent over 60 years of ergonomic study and application developing and refining a comprehensive product line to meet the seating objectives and needs of our clients. We proudly state that we have been in business under the same family name, same family ownership, same company name and same location for over 60 years. Our long SUCCESS is attributed to the fact that our loyal customers recognize our dedication to quality because we maintain the highest manufacturing and material standards. In this “veneer - particle board world”, we continue producing an all SOLID WOOD PRODUCT (no veneers, no pressed woods, no M.D.F., no oriented strand board - no particle boards). We use the highest quality and density polyurethane foam. We then upholster your furniture with the strongest and most decorative fabrics, which have rubberized backs and can be Teflon coated. Our hand rubbed wood finishes are the best in the market place. Our Sealers and Lacquers are state of the art, hard bar-top type Catalyzed Nitrocellulose Lacquer. We are LOCAL. When you need us – we are close by. Whether choosing new pews, platform furniture, interlocking chairs, pads, kneelers, or expert refurbishing of your existing product, you can feel secure that we will follow through with every detail as we have for over 60 years, because our people at Cardinal Church Furniture; Sales Staff, Designers, Lumbermen, Sawyers, Millers, Manufacturers, Sanders, Upholsterers, Finishers and Installers - are committed to meticulous and conscientious attention to detail. When we committed to this vocation we promised ourselves that we would strive to be the BEST we could be. Our prices are fair, yet competitive. We don’t guarantee we are the cheapest - but - we do guarantee that we strive to be the BEST. We guarantee to give you FULL - FAIR VALUE for your investment. If you select us to do your work - we will make certain you are glad you did. We’ll be delighted to work with you on your project. If you have any questions, we invite your call. Once again - thank you. REFURBISHMENT of your Existing Pews will not only save your congregation Money, it also has a tremendous positive impact on the WORLD ECOSYSTEM. 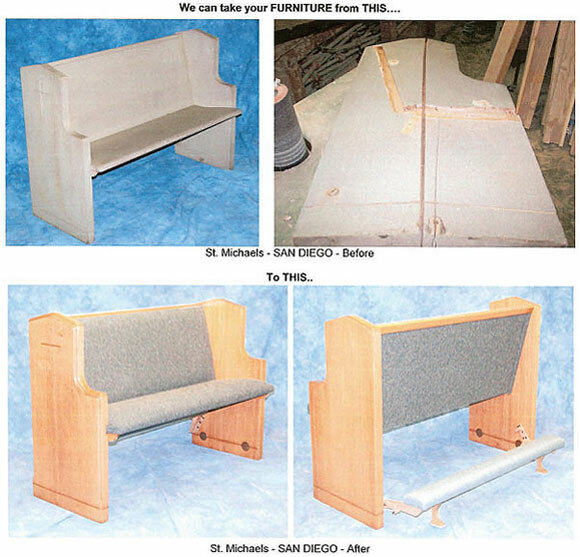 About 85% of your old Pew Materials will be re-cycled back into your newly re-vitalized furniture – re-manufactured furniture. COMPLETE FACTORY RE-CONDITIONING RE-UPHOLSTERY and RE-FINISHING. This is - by FAR – the BEST QUALITY process. This is the REAL DEAL - Complete FACTORY Re Upholstery and Re Finish of your pews. Your Pews will be FACTORY FRESH. 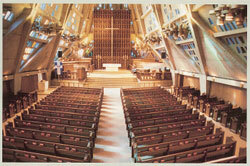 In this case our crew comes to your church, completely disassembles the pews then takes them to our Factory. The Seats, Backs and Back of Backs are professionally upholstered in our pneumatic seat and back presses. These presses have dies in them which shape the polyurethane to the correct ergonomic shape. Then the parts are returned to the church - re assembled and reinstalled. You can add Factory Re Finishing of the exposed wood parts to be done at the same time we Re Upholster. We also convert your pews to include our Hidden Chicago Expansion Bolt Torque Down Anchor System. Friday of the same week. We can keep them longer if there’s more maintenance you want to do, which can’t be completed during the time the pews are at our factory. On MONDAY, we’ll take this to our FACTORY. If your job is under 750 feet, we’ll return on FRIDAY of the same week with your FACTORY FRESH Pews. You won’t lose a Sunday Service.